What is your organizations strategic plan in gaining a greater market share from the global search engines? A web site is like a magazine or newspaper ad? Or like a TV ad? Search engine optimization (also known as 'search engine marketing', SEO, Internet promotions and SEM) is the equivalent of advertising in print media terminology. After a web site is developed, the site owner creates a marketing plan to ensure the visibility of the website. See this section of the site as a PDF (297K). The higher your Web site ranks in the results of an online search, the greater the chance that browsers will visit your Web site, and the more visitors, the more qualified leads. We help our clients generate more traffic to their Web sites using our search engine optimization techniques (SEO), and we’ve done so since 1995. 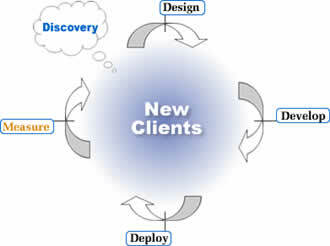 We offer a complete set of services geared towards achieving results, no matter how complex the competitive arena is. And we remind everyone that "Content is King"; the better the content is on your site, and the more relevant to your targeted industry and/or key phrases, the better your site will perform. Don't cheat; it hurts. Alot. Your site could be banned from the engine(s) permanently. If using internal staff that are on an incentive, make sure they don't cheat. (They usually do). If using a professional firm, make sure they don't cheat, and can provide a long-term structured plan to continue improving results. What are your company's goals online, and how should you achieve them? We analyze your business objectives and market situation and determines the right search engine strategies to deliver increased visibility, qualified traffic and customer conversion. How well does your site do in the natural (unpaid) search engine results? We will optimize your site content, copywriting, tagging and link popularity to be sure your site ranks at or near the top when users type in the keywords you care about. The keyword marketplace is a competitive free-for-all; prices fluctuate, and bids must continually be reassessed. We track the performance of all your search terms, dropping poor performers, adding new words, and altering prices as indicated. What happens when users get to your site? Do they find what they want? Can you convert them to customers? We perform a site usability analysis and provides recommendations for improving user flows, removing any stumbling blocks, and helping your site achieve its objective. A website is a reflection of your brand, as well as your best chance to communicate the value you offer your customers. We will help you architect, design, write and implement your site to make your offerings clear, compelling and differentiated, to help turn browsers into buyers. Increasingly, the Internet is a broadband world, capable of supporting complex interactions and animations along with high-quality video and audio. We are skilled in all the major rich media formats such as Flash, e-Learning and other specialized content, so we can help you create an immersive experience that engages prospects and customers. The most powerful attribute of the Internet is its accountability. We continually collect and analyze information about your search marketing program and use this data to adjust your spending allocations to maximize return.